View a selection of residential architecture projects Paul has designed in Dublin and Kildare. Extension, Renovation, New-Build, Eco-Upgrades. Extension and Full Renovation to a 1970's Glasnevin House. The client, a well-known author, had brought up her family in the house, which was subsequently rented and fell into disrepair. Our brief was to renovate and extend the house to create a modern home to which she and her husband could return to. A desire for a light-filled, contemporary home to live, write, entertain and display art generated a design which turned the house upside-down and introduced light into the middle of an awkward elongated plan at all three levels. The previously dim spaces now benefit from natural light filtering in from multiple directions, even on overcast days. Close collaboration between client and architect has resulted in the reinvention of this house to create real flexibility for living. Read our client's comments here. 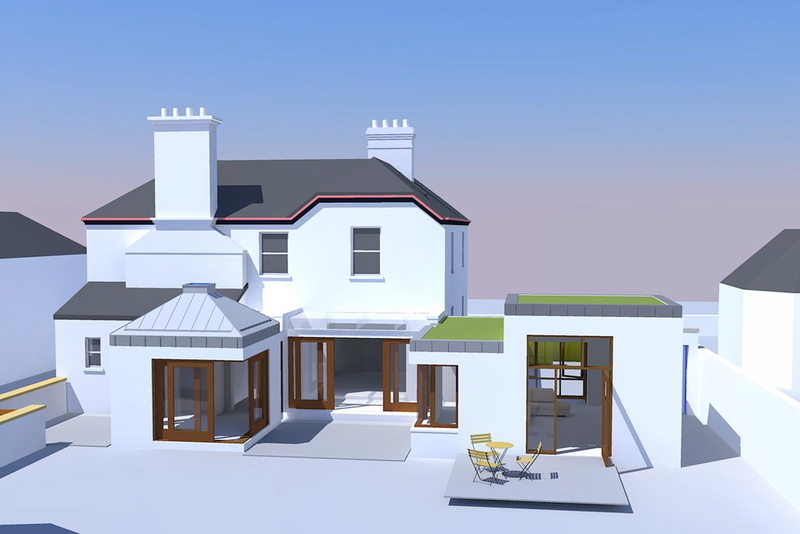 Renovation and Extension works to a Protected Structure House in Ranelagh, Dublin 6. There are three main elements to this protected structure renovation project: The addition of a projecting bath ‘oriel’ to the side wall of the rear return at first floor level, The attic has been converted to provide a sleeping loft, it is accessed by a new bespoke hardwood staircase, The original natural slate roof coverings to the main house were reinstated. Read more details here. Information about works to houses in Architectural Conservation Areas can be found here: What is an ACA? [Credits below]. Suburban House Extension & Alterations, South Dublin. The brief for this project was to extend an existing semi-detached house to the side and rear to create an enlarged open-plan kitchen, dining and lounge area to be the heart of the house with an enhanced relationship wiht the rear garden. A study that could be transformed into an additional spare bedroom for visitors along with a new utility room and downstairs shower room was also included. The design is flooded with light from sliding glazed doors and large frameless roof lights. The side and rear extension roofs are carefully designed to fit between tall separating brick walls. The project included the design of kitchen and other custom joinery units such as a study wall-mounted desk and a hidden fold-down bed. Extension and Renovation of Protected Structure House, Naas, Co.Kildare. To more closely integrate the house and its sizeable rear garden, a new single storey extension has been carefully designed. This extension has been designed with two main elements: A lounge close to the northern boundary wall, and a jewel-like informal dining room.These two spaces are linked to the house by a glazed corridor. The architectural language used for the extension will be cleanly contemporary, but is intended to sit comfortably with the rich materials and traditional massing of the Protected Structure. Read more here. [Credits below]. Sustainable Extension & Renovation to Ranelagh Period House. "This is a great example of a meticulous period restoration - as green as a period house can be" - The Irish Times. The client bought a house on Mount Pleasant Avenue Upper, which was in a serious state of disrepair. It was really dreadful and had been badly treated. The house was in three bedsits but turned out to be a joy to renovate. This is a house with a soul that has been carefully renovated, preserving its integrity while adding eclectic elements and perfectly combining old and new. Read more here. [Credits below]. Renovation & Extension of Jigginstown Villa, Naas, Co. Kildare. The proposed works at Jigginstown Villa have been carefully designed to strike the appropriate balance between the conservation of its significant elements, and the introduction of modern services and additional spaces for a contemporary family setting. All of the proposed extensions have been located to the rear and side of the house, leaving the more significant front elevations unchanged. The existing house of 1,550 Sqft has been extended to 3,200 Sqft. The extension has been designed in a subtle, contemporary architectural language, to provide a delicate contrast with the vernacular design and features found on the original structure. [Credits below]. 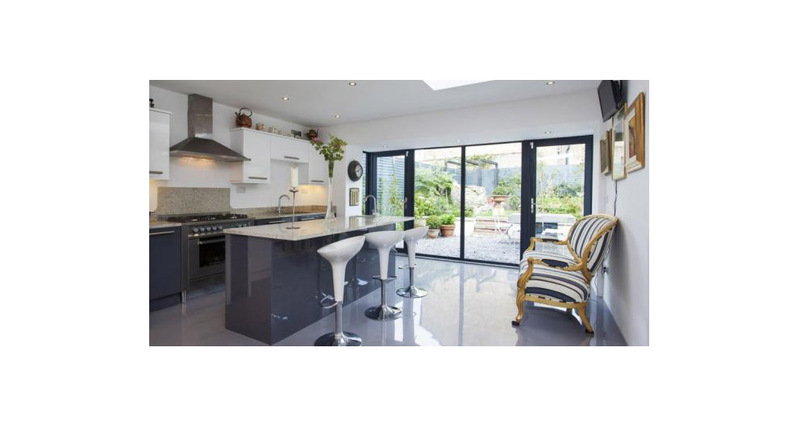 New Build House, Dalkey - Including Interior and Furniture Design. This new house was built on an awkward infill site in Dalkey with many planning constraints. The small site size demanded highly efficient planning of spaces. The interior was designed with many items of custom furniture and joinery to make the most of the available space. (This work was designed by Paul Mulhern while at Howley Harrington Architects).